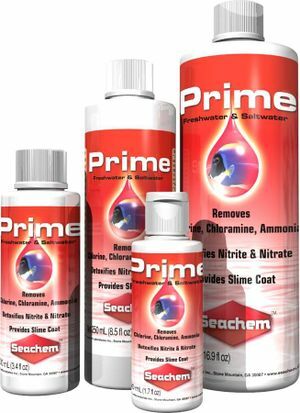 Prime is a commercial water conditioner made by Seachem. This is a high quality liquid product that is highly respected by aquarist hobbyists throughout the World. By adding it to your aquarium water you can instantly remove chlorine, chloramine and renders the released ammonia nontoxic for 24 hours . It also detoxifies nitrite and nitrate so that they too have no ill effect on the aquatic animals in your tank. It renders toxic Ammonia into nontoxic Ammonium which nitrifying bacteria can still consume. It also detoxifies any heavy metals that may be present in your tap water. Available in different sizes bottles, 5ml of this liquid per 200 Litres (52.8US G.) can remove 0.8 mg/L ammonia, 1.2 mg/L chloramine, or 3.3 mg/L chlorine. Or putting it another way, 1ml can detoxify a 40 Litres (10.6US G.) tank of the above levels. Seachem claims it is the second highest concentrated water conditioner on the market after their other product Aquavitro Alpha. Seachem claim it doesn't significantly reduce oxygen in the water unless, seriously overdosed or there is no nitrogen compounds to remove. Seachem claim that by using five times the normal dosage it will remove Nitrate. Aquarists can use this daily in conjunction with a bacteria starter product like Stability, BIO-Spira or Safestart to instantly make up a new aquarium safely within 24 hours and cause no harm to the animals with a typical cycling time of 5 days or less. Prime like all other water conditioners will cause most common test kits to read a false high nitrogen level. For example if testing for ammonia, Salicylate or Nessler based kits determine the total ammonia by raising the pH of the test solution to 12 or greater. At this high pH all ammonia removal products will breakdown and re-release the ammonia, thus giving you a false ammonia reading (it was probably only Ammonium). Same goes for nitrite or nitrate. Tip: Leave a sample of the water out in a cup for 24 hours and retest it for ammonia then. Any Prime in the sample will have gone by then. This product is usually found in the better range of aquarium and pet shops in USA and Europe. It is widely available online. ↑ "Prime's life in a freshwater tank"
↑ "Prime® is the second most concentrated dechlorinator on the market"
This page was last edited on 28 August 2013, at 13:07.